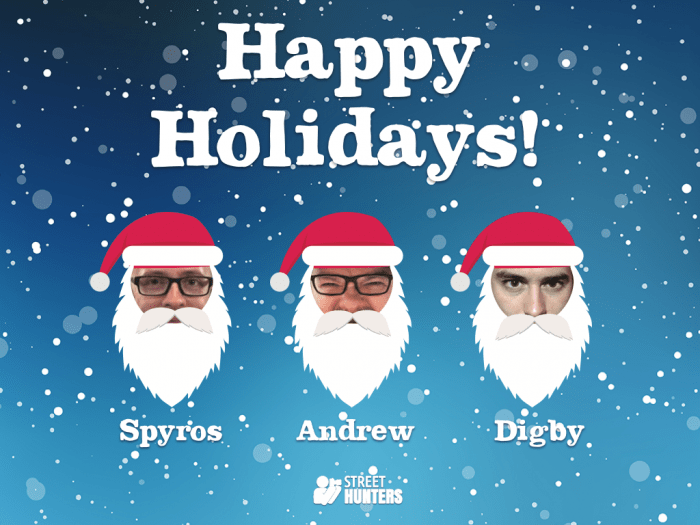 Happy Holidays from the Streethunters.net editorial team! Home Announcements We are taking a break for the holidays! Back soon! We are taking a break for the holidays! Back soon! One more year has gone by and we are still at it! As 2017 approaches we look back and see what a long way we have come since 2013 when we founded our website. Back then our dream was to create a Street Photography resource and now, we realise this dream has come true! We have Street Photography Book reviews, we have famous Street Photographer biographies, we have street photography tips, we have held events, we have videos, street photography contests, press releases and announcements, how-tos, featured photos, lists of top 10s, gear reviews, photo critiques, guides to shooting in various cities and more! In 2017 we aim to invest more time in our Youtube channel by growing our new Street Talk series because we want to get more in touch with you, to interact more with you and learn from you. We are going to be featuring more Street Photographers and their work, reviewing more books and shooting more Street Hunt videos! New How tos will always be posted and as long as camera companies and camera accessories companies send us their gear we will continue to write reviews for you! But what is most important to us is you, our Readers and for that reason we ask you to share your ideas with us and let us know what you would like us to write about. What interests you? What do you think could make our website even better as a street photography resource? Is there something that www.streethunters.net is missing? Comment below and share your thoughts with us please. However, before any of the above happens, we would like to let you know that we will be taking a break for a few days to recharge our batteries and devote some time to our families and loved ones. We will be shooting family snaps, preserving warm memories of this year’s holidays and try to detox from computer screens and the Internet. The only screens we want to be looking at are those of our cameras! So, we want to wish you all Happy Holidays and see you again on the 2nd of January 2017 with new stuff! Upon our return we hope to find lots of new camera bags waiting for us in our inbox so we can share them with you throughout the coming months!